RAPAPORT... A brand-management company that owns the Marilyn Monroe estate has bought the trademark rights to “Diamonds Are a Girl’s Best Friend” at an auction of assets belonging to Nirav Modi’s US businesses. ABG Intermediate Holdings, which trades as Authentic Brands Group (ABG), acquired the intellectual property related to the actress and singer’s famous song title for $50,000 last month, according to a court filing. The purchase covers several trademarks registered in the US, Canada, the European Union and with the World Intellectual Property Organization, as well as relevant internet domain names — including diamondsareagirlsbestfriend.com — and a video-game registration. A. Jaffe and Firestar Diamond, two of Modi’s American jewelry brands, were the previous owners. They filed for Chapter 11 in February after the Indian tycoon became the subject of a fraud investigation, with bankruptcy trustee Richard Levin subsequently liquidating the companies’ assets, including jewelry and intellectual property. ABG, founded by Canadian businessman Jamie Salter, acquired the rights to the Marilyn Monroe estate in 2011 for an undisclosed amount. The company did not respond to a request for comment Monday. 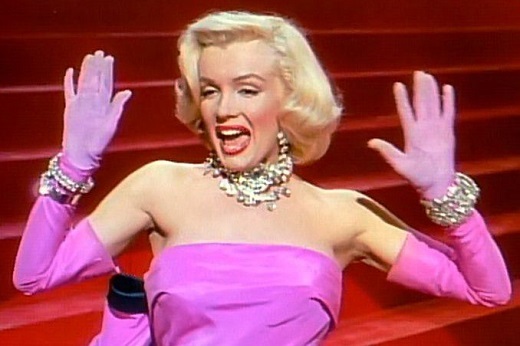 Image: Marilyn Monroe from the trailer for the film Gentlemen Prefer Blondes.